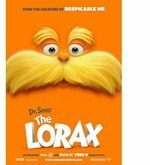 Dr. Seuss’ The Lorax was released in theaters today. The film is based on a children’s book with the same name, and the release was timed to coincide with Dr. Seuss’ birthday. The writer, who died in 1991, was born 108 years ago today. The Lorax is the first Dr. Seuss-based film in 3-D. The story evolves around a young boy who lives in a completely artificial world. His adventure begins when he tries to find a real tree to impress a girl. As an aside, it’s interesting to note that the young boy’s name is Theodor Seuss Geisel (voiced by Zax Efron). That is Dr. Seuss’ real name. The girl of his affection is named Audrey (voiced by Taylor Swift), which was the name of Dr. Seuss’ real-life (2nd) wife. The film has not gone over well with critics. Over at Rottentomatoes.com, the movie currently has a rating of 57% with 77 reviews so far. Regular viewers liked it quite a bit more, Rotten Tomato users (as opposed to ‘approved critics’) have rated the film 81%, with over 12,000 user ratings.